The ICOM IC-A24 Air Band Transceiver Radio from SkyGeek isn't one to boast, but it has been called "The Pilot's Favorite Handheld," and for good reason. It's a close cousin to the extremely popular ICOM A6 model, but with even more features and capabilities, making it easier than ever for pilots, ground crew and essential airport personnel to communicate. The transceiver radio is made by pilots for pilots, so it's very easy to hold and use � even in flight. With a large backlit display and a keypad that stay on until you turn it off, this radio is a must-have item for you flying night owls. The radio charges using an external DC power jack, plus it can still be used while it's charging. The U.S. version also lets you call a COM channel while using the VOR navigation. The radio has built-in storage and can hold up to 200 channels at a time. It also automatically saves the last 10 channels used, so it's easy to get in touch with recent contacts. The radio is even water resistant, so you won't get grounded by bad weather. See the user reviews for testimonials from pilots and crew members just like you. If you're already an ICOM A24 owner, feel free to add your own review and tell your fellow pilots how much you love this radio! 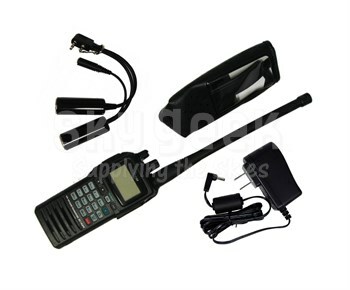 The ICOM IC-A24 Air Band Transceiver Radio package includes a wall charger, an Ni-MH battery, a headset adapter, an antenna, a belt clip and a carrying case. The ICOM aircraft radio is ready to go wherever you do. Note: Use the Volt AC map below to find the correct charger for your location. If you still have questions about plug types, get them answered here. Easy to use while flying: Simple one-handed operation is the most essential feature of the IC-A24/A6. The well labeled, large keypad provides user friendly operation. The large display shows both letters and numbers and is easy to see, making for fast frequency recognition. The display is backlit, and so is the keypad. The light stays on until you turn it off � a very handy feature for flying at night. "Flip-flop" channel recall: The IC-A24/A6 stores the last 10 channels used. You can easily recall those channels by pushing the �flip-flop� recall buttons on the front panel. It is convenient for switching between several channels, such as NAV and COM channels. VOR navigation: CDI mode display The IC-A24 has VOR navigation functions. The DVOR mode shows the radial to or from a VOR station and the CDI mode shows the course deviation to/from a VOR station. You can also input your intended radial to/from the VOR station and show the course deviation on the display. In the USA version, the duplex operation allows you to call a COM channel, while you are using VOR navigation. External DC power jack: An external DC power jack allows for operation with the wall charger, BC-110 or the cigarette lighter cable, CP-20. When the battery pack is installed, simultaneous charging during operation is also possible. In addition, an optional battery case, BP-208N, is available. Water resistant construction: The water resistant construction provides reliable operation in wet conditions. 220v charger for overseas use available at additional cost. Some versions do not include a battery pack, wall charger, headset adapter or carrying case.